I don’t know if this is a piece of bad judgment (a blog no-no) but I feel like talking about dying and death. A couple of things have made me ponder this for the past few days: the realisation that I really don’t want to be buried in the Relig Odhrain and a poem by Philip Larkin. One of the pleasures in ascending the decades is the acquired pleasure of contemplating my mortality . I’m very fortunate in that I have relatively excellent health but one of the big unknowns is, of course, how I will respond to adversity. Time will tell. So, though I feel that I’ve got off pretty lightly, I have seen a bit of death. My sister and I looked after our mother and father as they died and I’ve lost various good friends and family through the years. Modest, if you like, but enough to allow me some insights. Curiously and extraordinarily luckily, I have seen very little of hospitals, for myself or for others. As with most folk it’s not the being dead that holds the fear but the process of dying, and hospitals (perhaps because I have so little knowledge of them) hold a particular fear from me. This might be the demon that someday I’ll have to try to face ? When talking of death I’ve tended to introduce it with a jocular ‘One of the Scot’s favourite topics !’ but on reflection I wonder if this is any longer true ? I think it probably was in the past due to the pervasive influence of the presbyterian church and a natural cultural morbidity ?? and in 19th century Scotland it was raised to the level of an art-form. My sister and I have always, to some extent, straddled the Victorian and Modern worlds. Our grandfather was born in 1866 so our father, though born in 1921, grew up as a Late Victorian. Many of the values communicated by him to us upheld the mores and morality of that time. Our mother, who was thoroughly modern probably helped balance things up ! So, this off the cuff remark about Scotland probably says more about my age, upbringing and generational span than about contemporary Scotland, and I suspect that modern, younger scots would not even recognise the charicature any more. 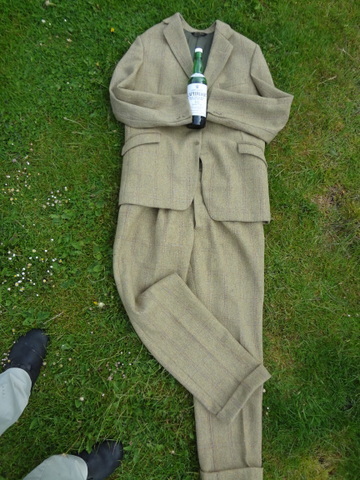 Several years ago I added a codecil to my Will specifying in great detail the manner of my funeral (for example, the material of coffin lining -blue silk rather than pink polyester, please), the quality of timber, that I wanted to be buried in my lovely tweed suit (Picture below) and the songs to sing. Even I eventually realised that this was maybe just a bit obsessive, so I had it removed if only to try to appear slightly more normal to my lawyer. I still hanker after the blue (Azure ? Prussian ?) lining but I try not to dwell on it. But it’s my funeral, after all, my party, so why shouldn’t I ? I’ve always wanted to be buried (as opposed to cremated) as it’s a sort of MacLean thing, or so I thought, and anyway, I find great comfort in skeletons. So when my father chose to be cremated I was puzzled as I’d have always thought that he would want to be buried. My mother, too, was cremated but that made greater sense as it was consistent with her beliefs. Likewise, for me, time has transfigured the Relig Odhrain into untruth of which only an attitude remains: you can apprehend it no more easily than the Burg or the Lewisian gneiss that I stand upon. Without personal connection or family buried there, what it is and what it meant are lost to the soundless damage of time. You see visitors disconsolately wander over it, listening, trying to hear the long hushed voices of the past. But ghosts don’t twitter in the Relig Odhrain for me or for most of these visitors: time has transformed it into a palimpsest of itself. I learn that kirkyards are about family, lived memory and connections and that without these they are cold and silent places. I went to a very fine funeral on Iona a month or so ago for the islandman ‘Uncle Davie’. The service was outside his house, in the old way, and afterwards we all processed in the sunshine across the island to the Relig Odhrain where he was laid to rest. It was a special occasion for a much loved man. Highlanders cetainly know how to do solemn and proud dignity and Davie will be at home in the Relig Odhrain. The last line of Larkins poem is for him. I’m sure that those who are left will be delighted to bury that tweed suit with you. I would have thought some lycra would ensure some fast rotation of the corpse.